OneVPN is a tough one. They stay true to the nature of VPNs but don’t necessarily adapt to market needs. They offer good security but perhaps isn’t the first pick for those who are looking for the best VPNs for Netflix. 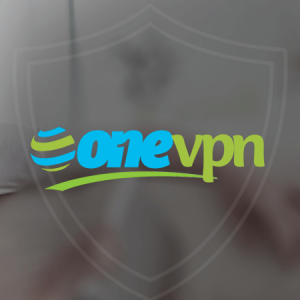 OneVPN proclaims itself the world’s fastest VPN with the greatest VPN features. It promises that you’ll be zipping across the web while you’re data remains both private and secure. It’s a bold claim. Can we trust OneVPN’s self-assessment or is it just a marketing slogan? 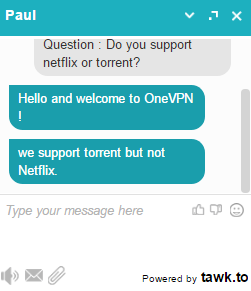 OneVPN does allow users to torrent without any restrictions. Choose any server you want for torrenting without any bandwidth limitations. In fact, OneVPN includes a guide on how and why to use torrents with their VPN. We’re happy to say you can download anything you want to your heart’s content using OneVPN. But since you’ll probably see a significant reduction in speeds, we also recommend you check out these torrent-friendly VPNs with better speeds. 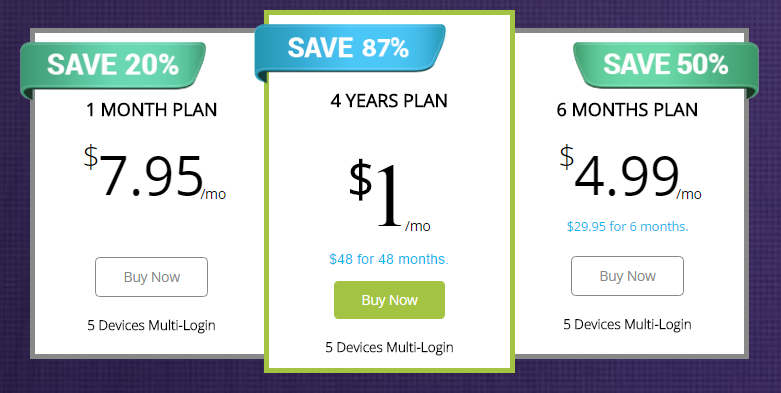 Pricing & Plans: $1 per month?! The only difference between the three plans is the amount of time you decide to sign up for. The more time, the cheaper the average cost on a month-to-month basis. It’s the standard pricing plan. Their base price is $7.95 per month. A bit costly. If you’re looking for more of a discount, and you’re committed, you can opt for the 6-month plan. It averages to $4.99 per month, for a grand total of $25.95. The cheapest plan is only $48.00, but that’s for four years. You have to be committed to OneVPN. But it does boil down to $1 per month. OneVPN has a wide range of payment options to choose between. You can use your credit cards, Paypal, Bitcoin, Payment Wall, Alipay or gift cards. If a VPN is subject to government decree a simple court order can force them to share user data. Fortunately, OneVPN maintains a no logging policy. They do not keep track of any information such as IP addresses, locations, numbers, payment processes, or physical address. However, they do keep track of your name and email address, which is minimal data. But this collection can still be risky since it is directly linked to the user. But OneVPN does assure users that will not your name or email address to any third party. IP and DNS Leak Test: Clean! As we mentioned earlier some of OneVPN’s IPs did not match the server location we picked. But despite this, we’re glad to see that our original IP or DNS address didn’t leak. For protocols, OneVPN uses OpenVPN, the leading protocol that’s also used by other top VPN companies. They also support PPTP, L2TP, and OpenConnect. OpenConnect is a protocol that’s considered an alternative to OpenVPN since it’s built on top of the same technology. OneVPN also uses the top of the line AES 256-encryption. It’s practically the best in the industry. In addition to their encryption, OneVPN also includes a built-in kill switch. To test OneVPN’s speeds we tried their 50Mbps connection. Our results were 50% of our normal connection speed. It’s not the worst, but the speed performance is a far cry from “fastest in the world”. Should we call that false advertising? OneVPN does not sport a free trial. That’s unfortunate. It’s not all bad though. They do offer a seven-day money back guarantee. So you can test their service for seven days at most. And if you decide OneVPN is not for you, simply ask for a refund. While we’re always happy to see when a VPN service offers a refund policy we’re a bit disappointed with this one. Seven days? It’s a very short time. Especially when other VPN services offer a 30-day money-back guarantee! OneVPN is compatible with all major platforms, including Windows, MacOS, iOS, Android, and home routers. And, as we’ve mentioned, you can connect up to five devices simultaneously. 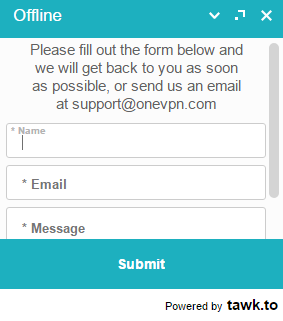 Signing up for OneVPN takes three easy steps. First, you’d have to choose the plan you want to subscribe to. Second, input your name and email address. And third, choose the payment method you want to use. After successfully signing up you’ll receive an email confirmation. Within that email you’ll find your login credentials. Keep that information safe. It’s how you’ll sign in to the client area on the OneVPN website. You’ll also receive a separate email which serves as your receipt. Smooth so far right? But then OneVPN becomes a hassle when you go to login. The client took a long time to open. Worse, by the time it did open we still hadn’t received our credentials. So we turned to live chat support. They gave us our credentials, but when we went to login the credentials did not work. OneVPN features a ticket and live chat support. 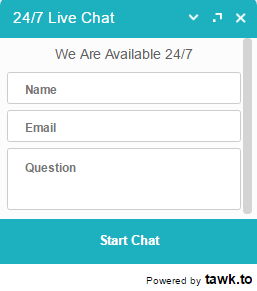 Their live chat advertises itself as 24/7, but since the company is currently in the middle of restructuring their support process, their chat support may be offline sometimes. Like many VPN websites, you contact live chat support by finding the icon on the bottom right-hand corner of the OneVPN site. Turns out, when we left a message, we were actually opening a ticket. We received an email letting us know our ticket had been logged. At least know the ticket system works. We refreshed the page and after a few minutes live chat was available. We managed to have a conversation with chat support to make sure it’s not just for show. So they definitely do have a live chat. We were having trouble connecting to their servers so we asked their live chat for help. They asked us to download remote control software so they could fix the issue themselves. But that doesn’t feel ultimately safe for us. We asked for another way, and they ended up guiding us so we could configure the software ourselves. We won’t break down the whole configuration process. Your experience may vary. For opening or submitting tickets, you can do so in their support page. OneVPN offers a Knowledge Base page on their website. It’s lackluster. 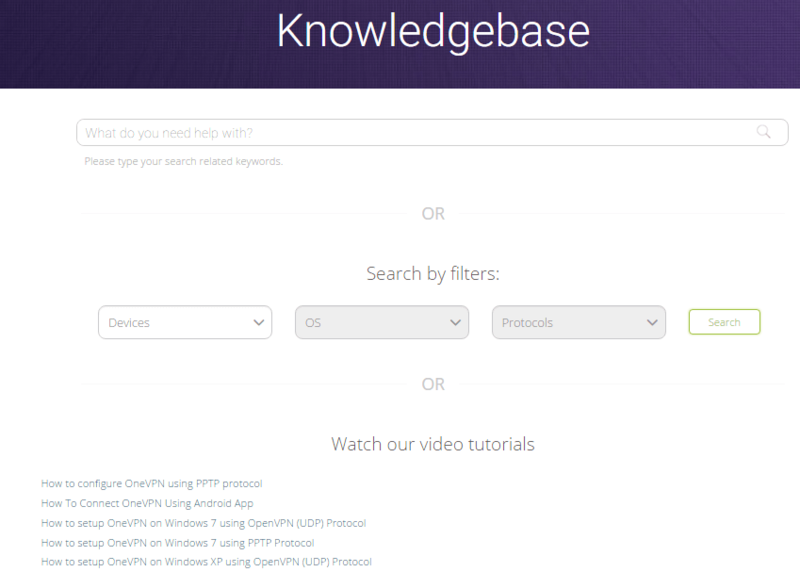 To use the knowledge base you have to search for whatever you’re looking for and hope that OneVPN has an answer. Searching is easy but we’re surprised there wasn’t a “Common Questions” section. They also have video tutorials that you can use as guides if you’re having trouble setting up or configuring your VPN. Besides their Knowledge Base there is a FAQ section. It answers common inquiries like “Do you have a free trial?” and “Do you allow torrent downloads?,” etc. OneVPN is alright as far as documentation is concerned. OneVPN features 390 servers spread across 59 different countries. While not an enormous number when compared to leading VPNs, like ExpressVPN and NordVPN, it’s certainly more than enough to meet most people’s needs. But then there’s an issue. Some reviews have stated that OneVPN doesn’t actually offer the number of servers they claim they have. We got curious. So we looked. What did we find? Well, it’s more about what we didn’t find: we didn’t find all the servers that OneVPN says they have. 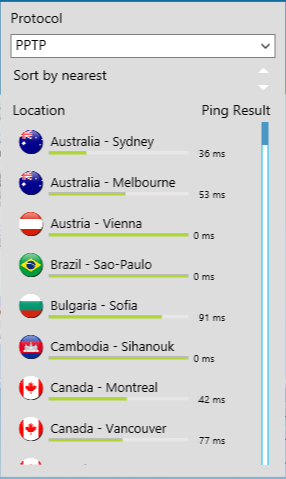 We connected to a Hong Kong server expecting to ping just south of China. But the connected IP address landed us in Singapore. Not only that but some servers flat-out didn’t work. It’s both puzzling and disconcerting. OneVPN claims to offer ease of access to hundreds of streaming sites. They even have a feature called “One-Stream”. It’s supposed to help you stream content from all over the world. In the age of “Netflix and chill”, getting around Netflix’s geo-content has become quite hard since Netflix has begun blocking VPNs. Is OneVPN the go-to source for accessing Netflix? To be fair, OneVPN has stated that not a single one of their “390 servers” can connect to Netflix (unlike these VPNs that can unblock Netflix without a problem). However, they do support other streaming sites like BBC iPlayer, Hulu, and Kodi. Better hope your favorite shows are on those other sites if you choose OneVPN. After installing the software you’ll see your current location in the program. You’ll then see that you’re connecting. Which was weird. Because we hadn’t chosen a server to connect to yet. Speaking of servers, where are they? All we saw immediately was what looks like a Google map. Not helpful. To find the servers you have to click the icon in the upper left-hand corner. It wasn’t obvious. OneVPN’s headquarters are in Hong Kong. It’s a product of Unravel Technologies, an IT security consulting firm. Unfortunately, there isn’t much public information about this company. The individuals behind OneVPN built the company focusing on the problems that they themselves encounter every day while using the Internet. As this VPN is based in Hong Kong they are outside the Five Eyes alliance. This means that OneVPN is not part of the group of countries who will willingly share your data if a government asks for it. Although, they are under China’s jurisdiction. And they only approve the “state-controlled” VPNs, or the ones that are allowed by the government. So this might still be a big thing to consider if you’re thinking of getting OneVPN. So do we recommend OneVPN? Having a kill switch, good encryption, and torrenting are definitely great features. But these features are nothing special that other VPNs don’t have. OneVPN’s performance is simply OK.
What we can say is that there are many better VPNs that offer the same features, better speed, and better performance. The one thing they have going for them is the average-dollar-cost which is literally $1 per month for a four-year contract. And that is unlikely unbeatable. So if you’re OK with 50% speed loss to cover yourself when torrenting or for simple browsing for just $1 a month, OneVPN is your choice. Now if you want something more than mediocre, we highly recommend you read our top 10 list.